Greeting card reproduced from an original watercolour by Eric Ravilious. 175 x 125mm with off-white paper envelope. Published by Canns Down Press. 'Newhave Harbour', 1937. This work has a gentle yet powerful charm. 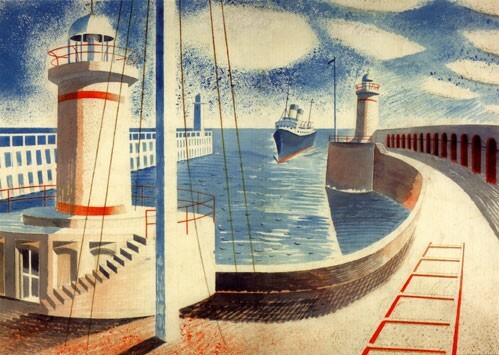 Later much of Ravilious's war art echoes images like Newhaven Harbour albeit in darker and more powerful tones.